My good friend Evan Zimmerman is something of a mad scientist when it comes to cocktails. As such, I often head across town to his bar, the Woodsman Tavern, when I need inspiration. On a recent visit, he performed a feat I'd heard whispers about, but that I'd never had the opportunity to witness in person: Infusing a cocktail with smoke. Everything started off normally. There was bourbon. There was ice. There was a rocks glass. And then? Fire. Not a lot of it, but enough to light a stick of Palo Santo wood, a South American varietal similar in aroma to frankincense or myrrh, like a piece of incense. My neighbors at the bar marveled as Evan captured the smoke emanating from the glowing ember with a glass bottle before pouring a mixture of vermouth, floral liqueur and bourbon into the bottle so as to infuse it with the smoke. The drink, which Evan calls the Holy Roller, arrived before me on the rocks, sans fire and brimstone. Yes, there's artistry and showmanship to adding smoke to a cocktail. But Evan's concoction isn't some idiotic flaming Dr. Pepper gimmick; there's an actual reason for the flame—flavor. Us bartenders have grown bored of the standard sours, juleps and manhattans. Consequently, we've felt compelled to add unexpected flavors to our drinks. Cue the smoke, which can now be found in everything from Bloody Marys (smoked tomatoes) to bitters (chipotle peppers, a.k.a. smoked jalapeños). Admittedly, not everyone is a fan. A majority of people might like smoke in barbecued or cured meats, but even the most ardent fan of tequila or scotch can be turned off by their smoked counterparts, mezcal and Islay whisky. I say those people don't know what they're missing. Evan uses smoke differently than other bartenders. (I repeat: This isn't mere gimmickry.) The Holy Roller actually employs the Palo Santo smoke as a fourth ingredient, which blends with and enhances the other components in the drink. The wood provides more structure to the earthy, bottom notes found in the bittersweet vermouth and bourbon, while the perfume-y qualities of the Palo Santo help elevate the floral qualities of the rose liqueur and the vermouth's herbs. One sip and I immediately returned to my bar to start lighting fires. Combine the ingredients in a mixing glass and stir to chill. 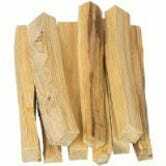 While the drink is chilling, ignite a piece of Palo Santo wood (in addition to Amazon, sticks are readily available from online incense shops)until it begins to smoke like a stick of incense. Invert a chilled 6-ounce bottle and fill it with the smoke. Strain the chilled cocktail into the smoke-filled bottle and quickly cork it to trap the smoke. Let the drink sit or swirl it for a few seconds; uncork and pour into a chilled rocks glass.